Mycophagy. Technically, the first part means mushroom and the second - eating. Put them together and it means eating mushrooms. An on-line dictionary offers that it is "the practice of eating mushrooms, especially those gathered in the wild." Delicious! 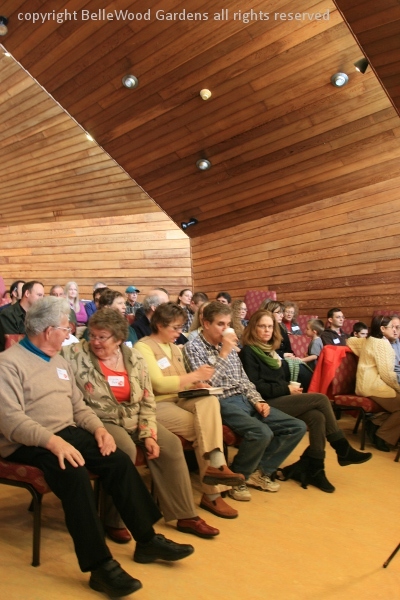 before an audience of enthusiastic society members. Space is somewhat limited so it's members only, and limited to about 70 people. 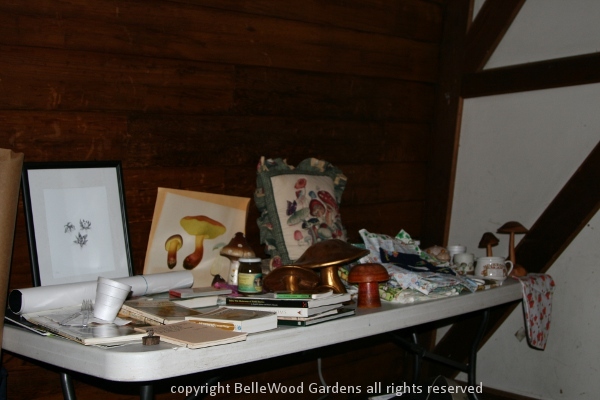 There's diversity to the event, which includes an auction of all things mushroom: books, of course, and prints. Decorative mushrooms made of wood, ceramic, metal. Tea towels and pillows, printed with mushrooms. For the quilters and sewers in the group there are fabrics- 1/4 yard to more than a yard- some whimsical, some fanciful, and some looking very much like mushrooms. How about a canister set, each one of course inspired by mushrooms. Dried mushrooms - and these were foraged. A pint of the choice and rare golden bolete, dried, was two seasons worth of foraging. The auction moved in fits and starts, filling time between the culinary adventures. 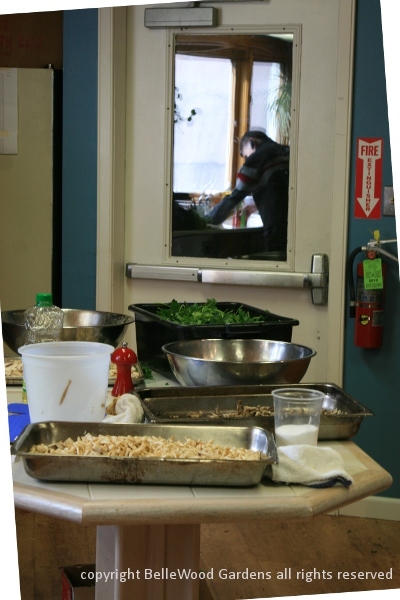 The Unitarian Church in East Brunswick, New Jersey has a reasonably well equipped kitchen. Prep and some cooking took place here, and dishes were finished in front of the audience. After all, even though the kitchen had enough space for several people to work at the same time, not an audience of 70 or so people. Instead there was a video link setup at the front of the auditorium. Two very bright lights on tall stands and centered between them a video camera pointing down at the work table. Live feed to a large screen so we could all see into the pot cooking away on a propane burner cook unit. Today's presenter was Luke Smithson, executive chef at Jaime Hollander Gourmet and Catering over in New Hope, Pennsylvania. An excellent choice for today's event as not only is he an experienced and dedicated chef, he's a member of NJMA and he loves to forage for edible mushrooms. Organized, with a checklist for each dish. 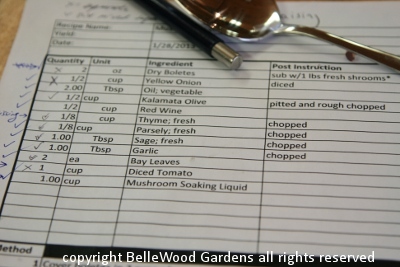 The mise en place means each item is measured, sliced, diced, prepped and ready to cook. Ingredients for a wilted kale and mushroom salad with miso vinegrette. 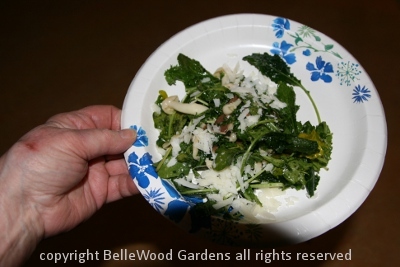 Salad, plated and garnished with some shaved Parmesan cheese. We didn't just watch, we dined. 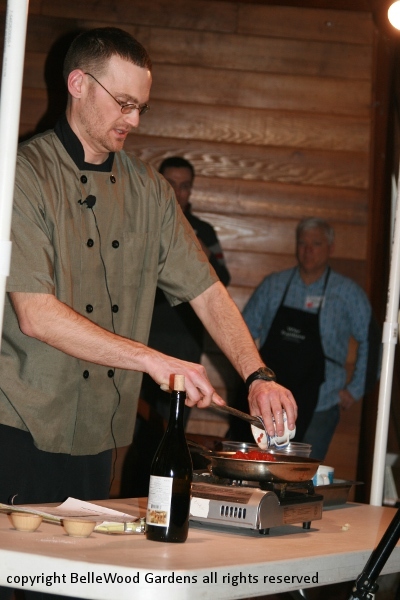 Luke at work, demonstrating a small sample of mushrooms cacciatore while the main portion is readied in the kitchen. sulphureus, chicken of the woods Tomatoes (which he's adding here), onions, and wine, to be served over polenta. 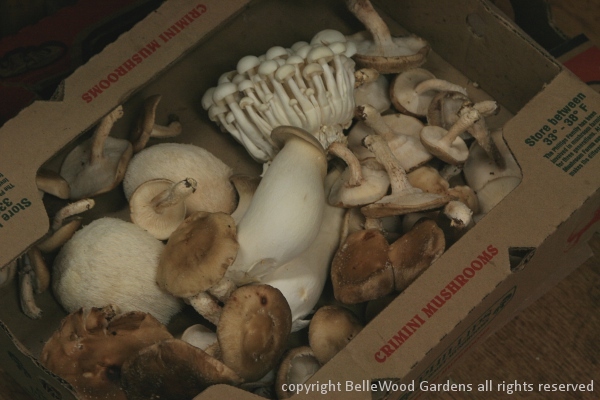 Mushrooms, Luke told us, are great as appetizers, as condiments, as seasoning, in entrees, even in desserts. They can be roasted, fried, boiled, braised, or sauteed. Their powerful yet delicate flavors are easy to overwhelm. And what he prepared for us today ran the gamut from two compound butters with either morels or black trumpet mushrooms, the afore mentioned wilted kale salad, a mushroom gratin, and mushrooms cacciatore, hunter's style. More than three hours flew by, at least for the audience. Luke and his crew were at it for longer than that. Kudos, for a memorable mycophagy feast.